Please join SABA-SC and the Western Justice Center for a Q&A discussion with D.C. Circuit Judge Sri Srinivasan on April 18, 2019. The event will be hosted at the downtown offices of O’Melveny & Myers LLP, and moderated by Kalpana Srinivasan (Susman Godfrey LLP). Judge Srinivasan grew up in Lawrence, Kansas and attended Stanford University (B.A., J.D., M.B.A). 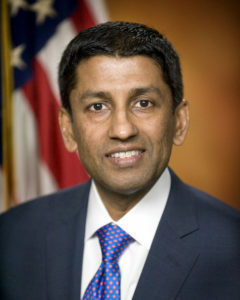 Prior to his confirmation, Srinivasan served as Principal Deputy Solicitor General of the United States and previously worked as a partner at O’Melveny. Over the course of his career, Judge Srinivasan argued 25 cases in the U.S. Supreme Court, including the landmark criminal decision Skilling v. United States. Judge Srinivasan was nominated by President Barack Obama and confirmed 97-0 by the Senate on May 23, 2013 to the United States Court of Appeals for the D.C. Circuit. South Asian snacks and refreshments will be served. We hope to see you there! SABA-SC individual memberships are available for attorneys, agents, other practitioners, and students. Join today to start participating. If you are currently an individual member of SABA-SC and would like to renew your membership, please renew here or contact us. Sponsorship of SABA-SC and PIF helps support the organization’s mission and members’ professional development.